First are we all co-inhabitants of this planet: red, yellow, black or white peoples, and tribal cultures; only then are we distinguished as Man or Woman. References of relationship must begin with knowing whom we are before we can begin to accurately perceive our relationship with others. And this awareness of our point of reference is something that only we, individually, can determine. When we, as Men, adopt the perspectives of another, be it a culture or gender, we lose the autonomy of self-determination. And in order to be effective and harmonious with all beings of this planet, in order to bring value from our lives into the world, we must know where we stand. Masculine and feminine are two terms that are very often confused with being synonymous with male and female. The masculine principle is commonly held to be that of the out-going, creative, active and motivational expression. Its spiritual nature is aligned with pure Spirit, knowledge and the perceiving function. The masculine principle, in relationship to life, family and community, is one of dedication. The feminine principle is that of introspection, magnetizing, receptivity and nurturing. Spiritually the essence of the feminine is the embodiment of life force. It is intuitive and of the feeling function. The keynote of the feminine expression relative to the sacredness of life force which it caretakes is that of surrender. We each, Man and Woman alike, have a masculine principle and a feminine principle within our Souls. As Men we are masculine in embodiment. Therefore we, as Men, are comprised of two-thirds masculine and one third feminine, just as Woman is two-thirds feminine and one-third masculine. When we Men seek to ‘run our energy’ at an equal balance of masculine and feminine, following the conventional wisdom of our contemporary culture, there is a sacrifice made, to a corresponding degree, of our masculinity. This denial of our own innate and natural balance in order to satisfy the expective demands of the culture results in a severe dysfunction in our lives, individually and culturally, akin to the degree of imbalance that resulted from a previous era’s insistence on the subjugation of the feminine principle in a Man’s life. In a masculine-dominant culturally referenced mode of being we Men lost touch with the feeling function, having neither sense of compassion nor respect for life. As we have slowly shifted into a feminine-dominant cultural modality in the last 40 years (at least in the ‘conscious community’) Men have become reticent to acknowledge their own innate masculine expressions. The consequence of this sacrifice of the masculine, in order to meet the 50/50 masculine/feminine balance of our life force, is that Men, in particular Men involved in the consciousness movement, have now lost touch with a true experience of being male. Specifically, this shows up in a Man’s life as an inability to assess a situation, discern the inherent truth in that circumstance, make a choice based upon discernment and commit his life in that choice. Simply put, these Men have become incapable of commitment! In an attempt to meet the demands to be ‘more feeling’, rather than integrating the feeling capacity, Men traded in the masculine component of knowledge to make room for feeling. By knowledge I mean ‘the knowingness of Spirit revealed’. This trade-off has confused Men by leaving them searching for self-reference in a framework that is not native to Man, i.e. emotional sensitivity in the manner of Woman. By trading-off knowledge for feeling many Men have lost touch with their own spirituality, or even the drive towards spiritual awakening. The model of spiritual growth that has been offered, presented by Women who had come into their own awakening, is through feeling/intuition. This Path is not necessarily one that works for Men. The spiritual quest of many Men in balance requires a path that is active, creative and knowledge oriented. He must know that his dedication in spiritual practices enables him to provide something of value, tangibly, to his family, community and the land. The spiritual offerings of the day, being heavily weighted in the feeling/intuition mode, leave many Men with no place to connect. As a result the attendance at spiritual workshops and events has a noticeable non-presence of Men. A typical proportion is two-thirds Women and one-third Men. This is the exact proportion of feminine/masculine relationship within a Woman! There are two archetypal expressions of the masculine that are potently relevant to the rebalancing of Men. One is that of the Warrior, the other the Man of Wisdom. The first, the Warrior, is a precursor to the second, the Man of Wisdom, which is itself the outgrowth of the development of the first. The Warrior is one who is honor bound to protect that and those which are inherently worthy of honor: Love, life, family and the land. A Warrior will do whatever it takes to protect these ones, even if it means the greatest of personal sacrifices. Do not confuse the Warrior with the Soldier or Mercenary. A Soldier is one who mindlessly follows the orders of a dominator hierarchy. A Mercenary is one who has corralled the talents of the Warrior and sells them off, as a commodity, to the highest bidder. The Soldier may be in the military or the ‘Yes Man’ of the corporate arena. A Mercenary may be a sniper in a foreign country’s employ or a corporate exec who will stop at nothing to attain high position. A Warrior operates with dignity and a reverence for life. The immediate field of operations where a Warrior exerts his attention is within his own Soul. Finding therein beliefs and attitudes, assumptions and prejudices that inhibit the free expression of love and honor for life, his own and that of his family and environs, he sets his commitment to the elimination and transformation of those debilitations. The Warrior’s greatest weapon is compassion. One who acts from other than compassionate love, i.e. hatred, vengeance or retribution, is no more than a Soldier/Mercenary, duty bound to defend positions and possessions. A Warrior meets his issues head-on, with courage and faith, and is willing to sacrifice these long-held emotionally invested conflicts for the greater good of himself and his family. The Man of Wisdom usually awakens within a Man about the age of 52 (as recognized by Earth-based cultures worldwide). The work of the Warrior, earnestly engaged, has brought the Man to a place of self-acceptance. The issues that so acutely drew the attention of the younger Man now have been resolved, or at least forgiven. No longer do the questions of the youth have such preponderance of value as once they did. 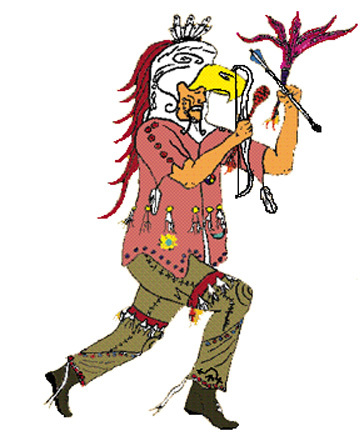 But neither does a Man of Wisdom dismiss that the younger people still have a right to these questions, and the knowing of their answers, and so endeavors to be of assistance to them, to assess the significance of behaviors, dreams, and choices that may arise in the lives of the Warrior and amongst the People, helping them to find understanding and comfort. The Man of Wisdom reflects upon his life, distills the essence of his experiences and offers something of value back into his community. It has come time for Men to be willing to claim their dignity as Warriors, and earn their rightful place as Men of Wisdom, amongst the People. Men, go forth, seek a Path that avails dignity of the masculine and honor of the feminine. Find, if you can, the answers to those burning questions and needs of the Man. And when you have found what you are able, turn to the succeeding generations and tell the story of your Journey, your Quest for truth and understanding, that others may benefit from your sacrifices and fulfillments. Go, in blessed courage, go. No commercial reproduction of this material is granted. Sharing and reproduction of this material is permitted only with the inclusion of this Addendum. Under no circumstances is editing or alteration of the content of this material permissible. Permission to share or reproduce in whole is granted only with acceptance of these conditions.